Well, we made it through another year and are well on our way to forming a plan for 2016. The biggest news is our new facility. We will be using the sun-room in Hunter House at 13428 Providence Road, Weddington as our new meeting place. We have undertaken a project to add access stairs, insulation, drywall and paint. The room was outfitted with custom electrical (all to code of course) and we’ll be moving in our new Powermatic lathe (donated by Charlotte Woodturners) tomorrow. For those who have the time, we could use a hand loading and unloading the lathe. We’ll meet at CWT’s former meeting place at Jackson Park Ministries (4001 Sentry Park Rd) near the airport at 10:00 AM. Directions to Hunter House A sign (WWT Meets Here) will be in the front yard between the two driveways on meeting days. If coming from the north, take I-485 Exit 57 (Providence Road) and travel approximately 2 1/4 miles to Hunter House on the right side of the road. If you are coming from the south on Providence Road, take the third left after the intersection of Providence Road and Weddington Road/HWY 84 (a U-Turn lane) and proceed to the driveways. Park where you can but please don’t block the driveways. On the left side of the house you’ll see a mulch pathway which you will take to the rear of the building then up the steps. We will start our meeting at 6:30 PM. Come early to share your turning stories with other members and enjoy a snack or two. 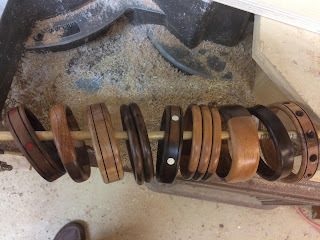 Our demonstrator this month is Jerry Measimer who will show us the ins and outs of making beautiful bangles with inlays. See the photo below for a sample of Jerry’s bangles. That will certainly impress the Ladies! Don't forget to come early for some Coffee! It might be blooming cold by then. The Raffle might have that special tool, or the wood you have been looking for, and since the venue is new, you will want to have a few minutes to get acquainted to everything and everyone. See you there with chips flying.